Perhaps your stained glass windows aren’t looking as clear or colorful as they used to. Or maybe the leading is bent out of shape in places and the glass itself is cracked or bulging. Either way, your Dallas church stained glass windows are in need of restoration. But with all the cost and effort involved, you may be wondering whether or not to go through with the repairs. Is stained glass restoration really worth it? We think so, yes! If the stained glass is able to be saved, and the glass itself is valuable for historic or sentimental reasons, getting it repaired could very well be worth the investment. 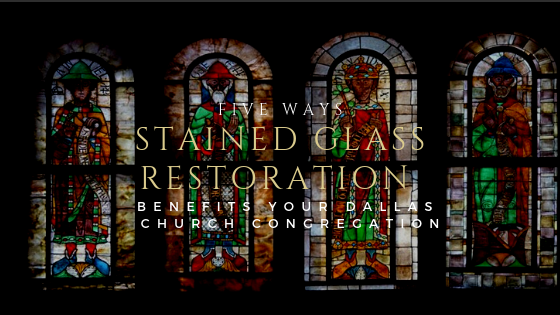 Here are some ways that stained glass restoration can benefit your Dallas church congregation. Your antique stained glass windows are an important part of your Dallas church. Opting for stained glass restoration can benefit your church congregation and the greater community in several ways. Here’s how. Stained glass creates privacy without blocking natural light, giving it the ability to create a secluded, comfortable atmosphere for churches. By preserving your stained glass, you help keep your church bright and beautiful. 2. Creates a soothing ambiance. Stained glass windows are often decorated with elegant religious artwork and Biblical imagery. For many, the experience of looking up at stained glass and being reminded of their religious beliefs is comforting and soothing. 3. Provides views of nature. Leaded glass windows or stained glass windows that have clear sections provide views of the outdoors that church attendees may enjoy. 4. Preserves the historical nature of your church. Stained glass windows are an important part of a historic church’s architecture. By opting for stained glass restoration, Dallas churches can preserve the true identity of their church and its historical beginnings. 5. Keeps church members happy. Some members of your church may feel emotionally attached to certain features or artwork, such as stained glass. They have old memories from when they were young of seeing the stained glass during service with their family and therefore feel that it is an important part of the church. By preserving your stained glass windows, you can ensure that your church members stay happy and keep returning. Keep the tradition of stained glass alive in your church. Call our office today to get a quote on church stained glass restoration in Dallas.